Guatemalan Sterling Silver Accented Suede Cord Necklace, "Cascade of Colors"
Estuardo Jimenez grew up in a family of Guatemalan artisans. Says Estuardo, "...one day we decided—as a family—that I should start to sell my own designs. Now, I work on my own pieces, designing and crafting alone. I help and support my parents in the workshop like I’ve always done." Estuardo puts his talents to use creating this multicolored pendant necklace. Suede leather straps of varying lengths in green, brown, pink, fuchsia, sky blue, and orange hues hang from black cotton cord. They are accented with brilliant sterling silver beads and end caps. The length can be adjusted as desired using the necklace's sliding knot. 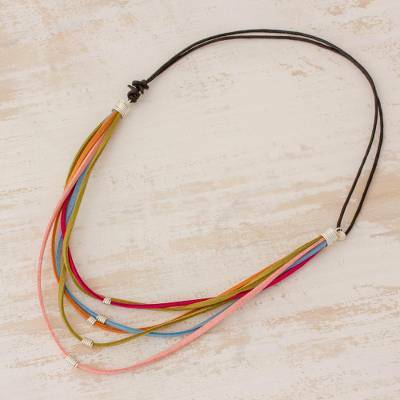 You can find suede cord necklace 'Cascade of Colors' by Estuardo Jimenez in jewelry categories such as No Stone Necklaces, Silver Necklaces, Sterling Silver Necklaces, Cotton Necklaces, Suede Necklaces, Long Necklaces and Cord Necklaces. Enjoy exploring these sections for other Novica treasures. Estuardo generates employment opportunities in his community by having apprentices help him with his work. “My name is Estuardo Jimenez and my hometown is near Antigua, Guatemala. I was born into a very close-knit and hard-working family. My parents have always been role models for me and my sisters. I’m a jeweler and I’ve been interested in this art because I have memories of it as far back as I can remember. “There’s always been jewelry work in my house. I’ve been lucky to see my father working growing up. I learned to appreciate and value it since I was young because I’d help out in my family’s workshop. Although I admit, sometimes I would only goof off and joke around. I’ve been asked a lot from whom I learned and it’s odd that I can’t name anyone in particular, although I’m clearly my dad’s number one fan. “Since I was young I liked to work with my uncles and other artisans in the workshop, watching the way they handled jade stones and silver until they finished a piece. As a child, I was curious to learn and do as the others, ‘working’ on my own pieces. Maybe my jewelry wasn’t the prettiest, but my parents motivated me and applauded my efforts. “When I was a teenager, I started to design and work on my own pieces after coming home from school. Little by little, I started experimenting and becoming a perfectionist. That’s how I earned my parents’ trust and they gave me more responsibilities in the workshop. “We joined Novica a few years ago as the Jiménez Family. Then one day we decided - as a family - that I should start to sell my own designs. Now, I work on my own pieces, designing and crafting alone. I help and support my parents in the workshop like I’ve always done. “This new journey where I present my pieces to the world alone as Estuardo and not as a family is an important undertaking for me because my work has to speak for me about where I’m from, my skills and my roots.